Perched between the magnificent UNESCO-listed Palais des Papes and the hilltop Rocher des Doms, the Avignon Cathedral (Cathedrale Notre-Dame des Doms) is somewhat eclipsed by its neighboring tourist magnets. While the Cathedral’s comparatively demure façade fails to incite the same gasps as the castle-like Palais, its iconic bell tower, capped with a 4.5-tonne gold statue of the Virgin Mary, still demands attention from the passing crowds. The cathedral has a history dating back to the 12th century, but the majority of the present-day building dates from the 15th and 17th centuries. Most notable are the richly decorated Romanesque-style interiors, where highlights include a 12th century marble throne, a beautiful gilded organ and a chapel dedicated to John XXII, housing an array of artifacts and religious icons. 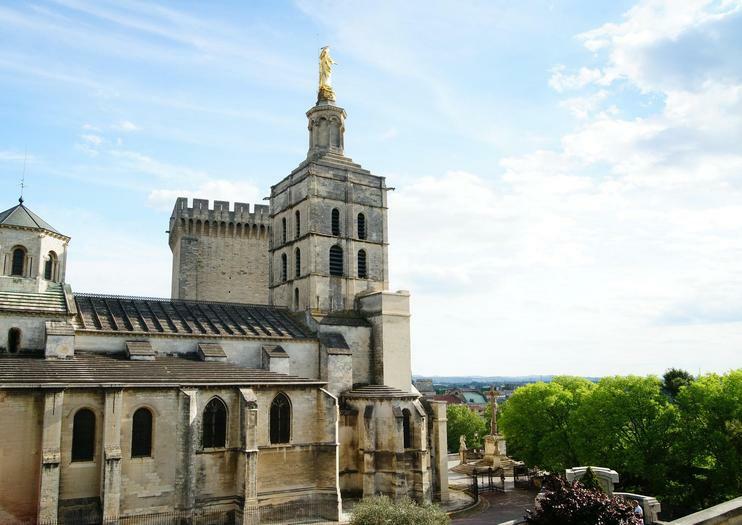 Avignon Cathedral is located on Place du Palais, next to the Palais des Papes in central Avignon and is open daily from 7.30am-8pm. Mass is held each morning and the cathedral also hosts concerts during the summer Festival d’Avignon. Find your professional guide at the cruise terminal in Marseille and board a tour bus for a private tour of Avignon.Upon your arrival in Avignon your guide will open the doors of the Popes' Palace and tell you all the secrets of the Popes during their stay in Avignon.After visiting the Popes 'Palace you can visit the cathedral and the Popes' gardens and you will have free time to stroll through the UNESCO-listed city center before reaching your bus. Enjoy a flexible day trip from Marseille to historic Avignon and visit a local wine estate. Your private excursion begins with a guided walking tour of Avignon—the home of papal power in the 14th century—and then you're free to explore on your own. Visit the Popes' Palace (own expense), peruse the Cathedral Notre-Dame des Domes, or stroll across the Point St-Bénezet bridge, inspiration for a famous French children's song. Stop off at the celebrated Châteauneuf-du-Pape wine estate on your return for a sampling of two of their best varietals. Set out from Marseille on a visit to Avignon, a stunning medieval that once served as seat of the Catholic papacy. This half-day private tour includes a guided walk through Avignon's UNESCO-listed center, taking in sights like the elegant Pont Saint-Bénezet Bridge and the city's restored ancient walls and towers. Learn its fascinating history as you stroll the cobbled streets, then spend some time exploring on your own. The Popes' Palace (own expense) is a definite highlight: with 20 various rooms to explore, including the pope's one-time private quarters.